Maureen McLane: one of our best contemporary poets. There was a couple lines I really liked but aside from that I was not a big fan of the poems. I thought they were kind of all over the place. Maureen N. McLane wants ideas to have glamour. That's why she puts them into poems. 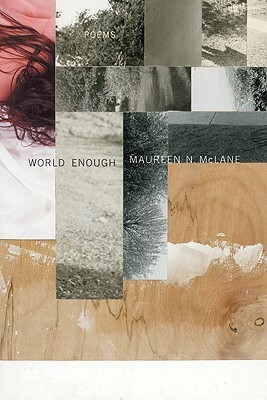 A poet-scholar who writes poems that marquee her thought (learned), McLane is a scrappy and inveterate synthesizer, and the poems in her second volume, World Enough, go alongside her work on early ballad ethnography, displaying her ideas about romance and Romance with a cool Rivettean sensuousness. "The frizzle-sizzle | menage: pansies and primulas | gone manic in the aisles | the gardeners monitor | by the Grand Hall | of Evolution ---| the names | the years to the custodians | of our archives." Not too vulgar to give us a bit of Foucault with our Agassiz, McLane sees the condition of post-modernty evident in our flitting about from one intellectual fascination to the next. The intervening poems of a public intellectual could hardly be less concerned with what Laura Riding called "the reasons for poetry." There's a hard shimmer of gamesmanship in her nonce pastiches. What it's "nostalgia" to "think otherwise, | or true," is just that unreconstructed urbanity in "Strange | to live in historical skin | the freckles the age spots | the pale privilege made | by ancestors I cannot name." Truly an exceptional collection of poetry, "World Enough" is unlike anything I have read before and I really do mean it. Everything I knew about form and style before this book were totally changed by the sheer lack of form in these poems, yet at the same time they were so musical and their structuring made sense. It was wonderful to see such a wide range of ideas that all lead back to the same theme. The only downside is that some poems got a little too abstract for me at a certain point and I lost the gist of the poem for a bit, but otherwise this collection was perfect. I think with a few more years of experience and revisiting this one in the future I'll love it even more than I already do. The poems I like best in this book are the ones that deal with places, maybe because these poems are full of satisfying specificity: Vermont and its lake and gulls, Saratoga in summer rain, L.A. with its oleander and "Hockney blue" pools and, perhaps my favorite poems of all, the ones about Paris in the third section of the book—poems like "Jardin du Luxembourg" or poems like "Palais Royal" with its "bankers on lunchbreak/and grandmas with children" soaking up the sun by the fountain. Unique style and tone - would recommend strongly!